The displayed image depicts the structural look of the product listed. (Example: Shape of Spokes or Windows) The image DOES NOT represent the actual color or finish of the item being sold. Customers should select the vehicle they wish to purchase parts for and then choose the color, finish, condition, position on the vehicle (if applicable) and any other options listed before adding to cart. 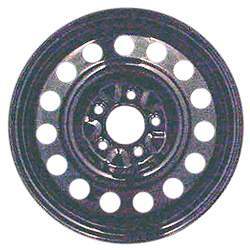 This is a 15 Hole 16x6.5 Inch, 5x115mm Bolt Pattern, One Piece Steel Wheel, Rim. The position on the vehicle is Universal. Wheel does not have center cap guide holes. Interchange Number is 8043. Manufacturer Part Number is 9593083; 9593296; 9595642. Identification Stamp Number is 132348; RNE. Our company is not affliliated with General Motors. All trademarks mentioned herein belong to their respective owners. WheelsTiresandMore.com offers one of the best warranties in the automotive marketplace. If your product is not the correct product, or not what you expected, simply contact our Customer Service Department and explain the reason for the return. Keep in mind that warranty service requires verification of ownership and date of purchase, which appears on your original invoice from the website you purchased it from. If acceptable proof of purchase is not available the return is VOID and will not receive a refund or credit.